Before I delve in… A special thumbs up goes out to local Buffalonian and Nichols alum Emily Pfalzer, who I just found out while looking up the spelling of her last name, was born the day before me! Years excluded. A) It was an idea for a feature that I actually came up with. B) It involved one of my (and many others in my age group) very first memories as a very young sports fan. C) It dealt with not the triumph of the event, but the disappointment leading up to it for two guys, which I found unique. 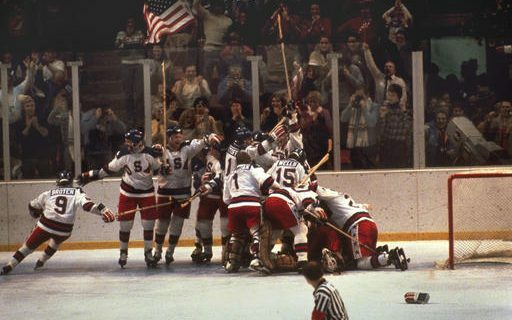 Many consider the 1980 U.S. hockey team’s gold medal run, specifically the upset of the Russians, as the greatest moment in American sports history. There have been movies about it, documentaries about it, debates about its legacy, and so on. When coming up with a way to honor the anniversary of the “Miracle on Ice”, our approach took a different spin on that historic event. The brass of the ESPN Features Unit in Bristol gave me the reigns to tell the story, which is an honor I was grateful for. From the youth level to the professional level, the norm is for a team to be built from a large group of athletes who, as we say, “try out” in the months leading up to the day when that final roster is decided by a coach or in some cases a manager. As euphoric the thrill is of making it onto a particular team, it can be as crushing to not do so. For Ralph Cox and Jack Hughes, the final two cuts of the 1980 team, they had to live with “just missing out,” as one of them said, on being a part of the “Miracle on Ice”. Personally, at this time in my career, despite this opportunity, I had been in a situation where I was not enjoying life at ESPN in Bristol. I had been passed over for promotions, I admit in many cases deservedly. Anytime that happens in any line of work, it can be a very tough pill to swallow. You know that what you may lack in talent, you feel like you make up for in other ways. It can be, and definitely was, a very competitive environment for any upcoming promotions in Bristol. The announcements during those years were so rare that when they were announced, it became instant buzz around Bristol’s campus. When you work at ESPN, it is very easy to get caught up in where you stand in the eyes of your bosses. The parallel with real sports competition is in a way funny how similar it is. I felt like a bench player basically around this time who was called in because of an injury to a starter. Anyhow… because of what I was going through at the time, getting to talk to both Ralph and Jack about their lives since 1980 meant that much more to me. The two of them were both terrific guys. They’d never talked on camera at that time about being cut. When I called captain Mike Eruzione to ask him to participate in the piece he said to me, “Mike, I have been asked 1000 questions about the “Miracle on Ice”, but this will be the first time anyone has ever asked me about Ralph and Jack,” which was pretty cool to hear. The feature from first day of prep to its airing took about four weeks. Tasks included making calls, setting up interviews, finding footage, shooting fresh video, script writing, and editing. The interviews were conducted by teacher-turned-ESPN reporter Steve Cyphers, who also worked with me on the writing of the script. They took place in Boston, where both players and Eruzione, now lived. Ralph seemed more comfortable talking about it, and interestingly enough, Ralph seemed to have been the less upset of the two with how it went down. Jack was clearly more nervous to recollect his memories of it… often swallowing his own words, which is common for people not used to be talking on camera. It was one man’s decision to get the roster down to where it needed to be. Legendary coach of the team, Herb Brooks, was that person, and ironically it was Brooks who was the final cut from the 1960 U.S. team that won the gold medal. Ralph, a winger, although extremely disappointed, understood that the team was already deep offensively. Jack, a defenseman, felt Brooks really had it out for him, and that he was setting him up to fail before sending him home. It should be noted, sadly, Brooks was killed in a car accident the year before we started working on it, so we never got to hear his side of his decision. I think each guy spoke to us for 30 minutes, and the piece came in at about 6:34. Typical “just find the best stuff” challenges of feature producing. In the end, what I found to be remarkable was both Ralph and Jack were emphatic that the players who did win gold always considered them as part of the team. They were always invited to group gatherings, golf tournaments, and anniversaries. That tells you even more why this team was so special. The completed piece itself was the featured “long” story that aired on the Sunday Sportscenter that week, which was the 25th anniversary of the gold medal game. It was a pretty amazing feeling watching the finished product at home that night. I received more postive feedback than I had ever before. That confidence I think led me to accept the new ESPN Hollywood role in Los Angeles months later. Unfortunately, just so everyone knows, I would attach a link to the piece itself, but I only have it on a resume reel in a box somewhere, on some sort of tape format that would be impossible to transfer, so I will leave the finished product a mystery. Also, because of all the Olympics footage, there are a bunch of clearance rights issues anyhow which cost a ton to pay for usage. I don’t think Kevin and Paul have the BSP budget… yet.